The last couple of weeks I’ve been catching up with a gothic adventure game so brutally difficult that I want to break down and cry. I’ve never actually finished this game; though I find its moody atmosphere and gorgeous depictions of decrepit, crumbling castles and brooding, shadowy outdoors to be so incredibly appealing, as someone who grew up on a steady diet of the gothic fantasy genre. Related reading: If you're in the mood for retro Castlevania games, then here's a retro review of the first handheld one - Castlevania Adventure. It’s just that difficult that I don’t think I’m physically capable of beating the game. Not from lack of trying, and not from spending hour upon hour carefully learning everything there is about the game so I can inch one step further. The hulking bosses have attack patterns that I simply can’t react to fast enough, and the lonely paths leading up to those bosses so filled with traps and monsters never fail to catch me unaware. That gothic adventure game I’m talking about is not Dark Souls. That game is a cakewalk compared to this one. 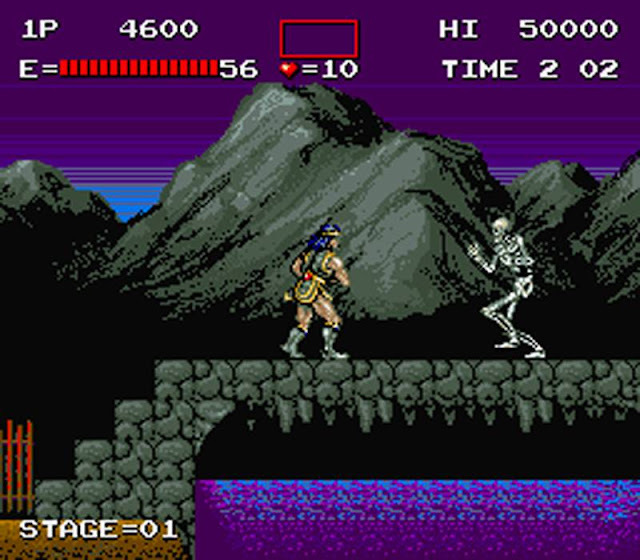 It’s an early Castlevania game, but not those overly sanitised console platformers. I see a lot of people calling the original Castlevania and its direct sequels “difficult,” but they know nothing (Jon Snow). No, I’m talking about the first arcade Castlevania. I’m talking about a game that takes the basic ideas of those early Castlevania games, and then throws in an unhinged Konami determined to rip every coin out of the pockets of anyone brave enough to actually try this game in the arcades. I’m talking about Haunted Castle. A game that haunts my dreams any night after I’ve played it. It’s beautiful, it’s ravishing, it’s incredible. If you ever get the chance to play it, go in expecting you’ll never finish it, but play it anyway, because no matter how far you get in, you’re in for one incredible experience. 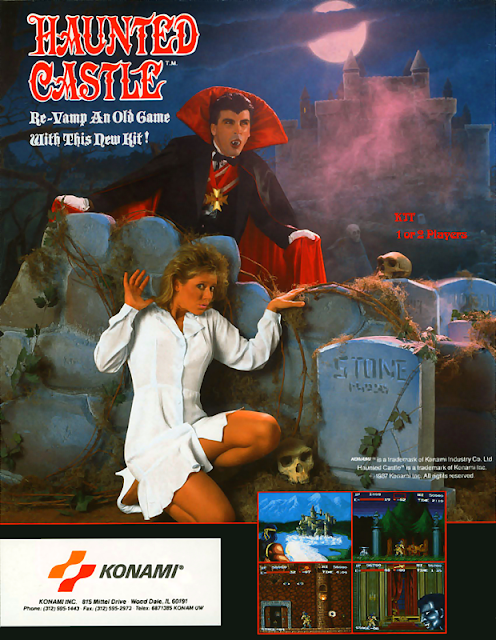 Haunted Castle was originally released back in 1988, making one one of the earliest Castlevania titles, predated only the first two Castlevanias on NES, and a game on the obscure MSX2 platform; Vampire Killer. Haunted Castle is in some ways shorter and more limited than even those earlier games; there are just six or seven levels (I believe. I’ve only managed to get to the fourth), and each level can be completed in around a minute or two. That time doesn’t, of course, include the dozens - or hundreds - of retries that you’ll need to be able to get through any single level without a game over screen. Haunted Castle throws every nasty trick in the book at you. Enemies that seem impossible to avoid (though really you just need a pixel-perfect response to defeat them), traps that come out of nowhere and are almost certain to ruin you the first time you encounter them (and then you’ll do silly things to have them ruin you again even when you know what to expect), and bosses with attack patterns that are just brutal. It’s a game that slips into being completely unfair, and often. For example, the very first boss is Medusa, and part of her arsenal - beyond being tall enough to be almost impossible to avoid as she zips from one end of the screen to the other - are snake projectiles, which scoot across the floor and can’t be killed. You need to jump to avoid them. Except that the graphical foreground means that those snake things are hidden at times, and hard to time a jump over. It only gets more difficult from there. That’s the easy boss. So why on earth would someone subject themselves to this kind of cruelty, I hear you ask? It’s quite simple, really. The game is such an incredible work in every way. Sure, it’s difficult, but it’s also gorgeous and has an amazing soundtrack. Compared to the other Castlevania titles that were being released at the time, it’s easy to see why arcades remained so dominant in those early days of console gaming. To this day I think Haunted Castle holds up in presentation; it's a textbook example of just what detailed sprite work can do in creating a thick, dripping atmosphere. And though it is brutally difficult, Haunted Castle also feels rewarding. It’s a game about unspeakable horrors, and a descent into Dracula’s castle. It almost feels right that it’s a hopeless quest, and it feels appropriate that it’s brutal from its opening seconds. That’s not to say later Castlevania games (as in, games that I can actually finish) were poor by any means, but Haunted Castle does feel thematically on-point, and putting aside considerations around playability and gaminess, as a game where you go in knowing success is almost impossible, it’s curious, and you quickly learn to enjoy smaller rewards, like getting a couple further platforms in before dying. Related reading: A retro review of the first Castlevania game ever, the NES' Castlevania. 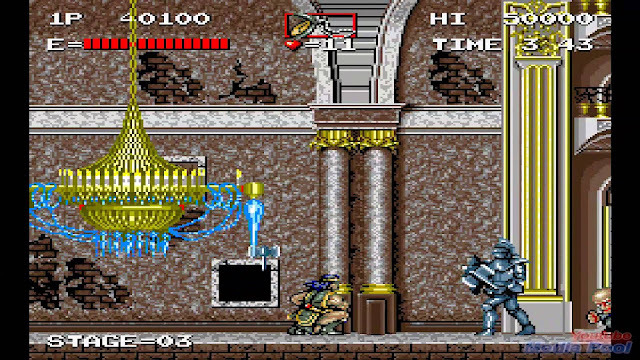 Even among other super-difficult games from yesteryear (and, yes, I did finish Ghosts ‘n Goblins) Haunted Castle has got to be the most difficult game I’ve encountered. Usually, when I’m sufficiently hooked on a game’s concept, I’ll persist at it until I’ve finally pushed all the way through it, as I did with Ghosts ‘n Goblins. I have been persisting alright, but to date, Haunted Castle has frustrated any and all attempts to master it. I’ll keep plugging away though. Who knows, perhaps one day I’ll finally crack it.